When Hanharr was hunting Mira, she managed to trick him into running into his own minefield. Hanharr was critically injured, but alive. Mira expresses that she should have killed him, but for some reason, she couldn’t. She said that she could hear him speak, but that what she heard was less of a roar and more an echo of it. We all know that this kind of thing happens all the time, but we never got this clear an example of it. Jedi and other force users frequently say things like: “The force has led us here for a reason.” Now we’re getting an example of how the force can directly and invasively manipulate separate individuals. Mira says that she thinks that Harharr was begging her to let him live. But we all know that is the last thing Hanharr wants. In his mind, if his life is saved, the life debt he would have to pledge would turn him into a slave again. So how could it be that Mira was hearing this? She said that Hanharr’s voice wasn’t a roar, but an echo of it. In terms of sound, an echo is when noise hits a hard surface and reflects back to listeners. You could imagine that the force is that hard surface. But that would suggest that the force is manipulating sound waves, and I don’t think it is. I believe that the force manipulates living beings, in this case, Mira. More specifically, the force is manipulating her senses. She heard Hanharr beg for his life because that’s what the force wanted her to hear. The Miraluka species perceive the world through the force in an even more extreme way. It’s the only thing they could possibly know throughout their entire lives. Which means that if the force has a will, the Miraluka always see what the force wants them to see. Being force sensitive, the Jedi are much the same. They perceive the world through senses that are filtered through the force. It was those who disconnected from the force, like Kreia and the Exile, who saw their surroundings for what it was. I mention force sensitivity, but in reality it makes me wonder. The force flows through all living things. The reality that all the people in this galaxy perceive; what they see, hear, smell, is it really how they think it is? I can’t say that the force is micromanaging the senses of trillions of people, but with something that’s seemingly omnipotent, I can’t rule it out either. I have to maintain that people who are balanced within force alignment can’t be directly controlled by the force. If I had to guess, I would say that most people who don’t believe in the force would be balanced, or at least closer to balanced than others. But that begs the question, are most people balanced or do most people align to a side? Mira leans quite a bit towards the light, so she heard “save me”. If she leaned to the dark, would she have heard “kill me”? That’s in question because the force seemingly wanted Hanharr alive. So instead I would have to guess that she would have heard “enslave me” instead. Why would the force what him alive? No one can be sure. The force’s motivation and end goal? No one knows. The Jedi perpetuated the idea that the force wants balance. In the opinion of the Jedi, the definition of “balance” is light side supremacy. The Sith say that it’s a force of nature that should be harnessed, exploited, and used for one’s own ends. Personally I think they’re both wrong. No one knows what the force wants and it’s obviously not like a piece of firewood. No one has ever, or can ever speak to it directly. All we see are the effects of it pursuing its secret objective. Galactic manipulations that constantly lead to war. Which means it’s goal must include senseless war. Senseless to us because we don’t know the purpose of it, and whether it’s Jedi and Sith or otherwise, it’s almost always a conflict between the two extremes of light and dark. There’s never any synthesis from these conflicts. Once it’s over, no one ever learns anything about how to avoid it next time. They just go back to whatever it was they were doing before and they “watch out” for the enemy. But no one ever tries to solve the problem of why the enemy exists or why they hate each other or why you have to fight. A recent debate I had with someone led me to conclude that it is possible for the force to manipulate people who are disconnected from it. But only indirectly. It can’t control the exile’s actions, but it can control the actions of the people around the exile. However, it would have to be people who are not the exile’s closest allies. It manipulated Mira, but only before she joined the Exile. Meetra Surik creates very strong force bonds and even disconnected from the force, she’s a natural leader, and people feel compelled to follow her. In a way, the exile flows through all of her party members, just like the force. It might have been a constant tug of war match between the exile and the force. A tug of war to claim the souls of the people around the exile. Perhaps the amount of influence you have with someone is the game mechanic that reflected this. Even if she failed to do this or came into contact with people who aren’t bonded to her, in other words, people who the force could use to influence her actions indirectly, Kreia was teaching the exile to stay true to herself. Sometimes even suggesting that the exile use and discard these people as tools. All to avoid outside influence? Perhaps. The writer for Rockstar games, Dan Houser, said that he avoids watching television shows that resemble the themes of the Grand Theft Auto franchise too closely. He hasn’t seen Breaking Bad for instance and I completely understand. He doesn’t want his writing ending up being hindered by or overly resembling the narratives presented in those shows. There is a video on YouTube that is famous within the KOTOR community. “The Philosophy of Kreia: A Critical Examination of Star Wars” has almost 2 million views and I haven’t seen it. At first it was the two hour mark that was daunting. 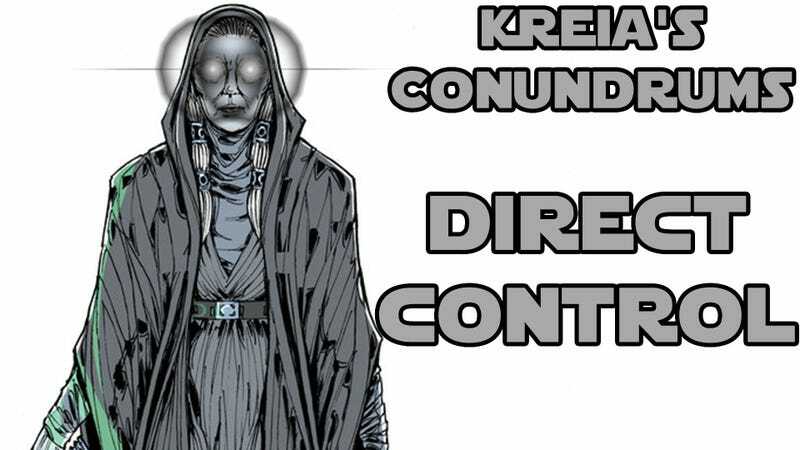 But after starting the Kreia’s Conundrums series I decided that I can’t watch it. The numbers and its reputation tell me that it is worthwhile. I’ve also interacted with the creator in the comments section of some of my own videos. He’s obviously an intelligent individual, so I have no doubt that it’s a good video. But I’m too worried that it might influence my own thoughts on Kreia too much. It’s not inherently a bad thing to quote someone or to retell what someone else said if it’s because it adheres to what you truly believe. But when it comes to this series, I want to see where my own thoughts take me and tell you what I think. The last thing I would want is for my words to merely be an echo. I wonder my words be echoed someday. If so, will the echo be accurate or will it go through a filter and come out the other end as a tool to serve one’s purposes?